The persistent problem of vacancies in teaching positions in public institutions has been short-sightedly addressed by the government through a system of hiring ad-hoc teachers. These teachers are allotted the same responsibilities as the permanent faculty but lack job security. They are also underpaid and not provided with the various social security benefits the permanent faculty receives. Recently, a panel set up by the University Grants Commission (UGC) has recommended the scrapping of this system. Further, the UGC's pay review committee has recommended the payment of salaries as per the seventh central pay commission. It has also suggested a system where grants are allocated to universities based on the number of vacancies filled by them. Tsering (name changed) and Tarak Agung Tark share their experiences as ad hoc teachers in a government college in Sikkim and a school in Arunachal Pradesh respectively. Their accounts reveal the impact of ill-conceived measures that fail to address the systemic lacunae in the hiring of teachers in government schools and universities. Tsering (name changed) had been working as an Assistant Professor on an ad-hoc appointment for five and half years in a Government college in Sikkim. The work contract was for a period of one academic year – from 1st July to 31st of June every year. Although her appointment was ad hoc, the workload was the same as that of a permanent employee. However, the employment terms and conditions were different for the regular and contractual workers. The contractual workers did not have any provisions for casual leave, travelling allowances, medical leaves or allowances, pension, house rent allowances and also no annual increment of salary. When she joined in 2012, her consolidated pay scale was twenty two thousand rupees per month, which was not as per University Grant Commission pay scale. A salary of twenty thousand rupees was given to those who did clear the NET (National Eligibility Test). Since the pay difference between teachers who passed the NET and those who did not was two thousand rupees, there was very little incentive to clear the NET. She could avail of only two months of paid maternity leave. She was told to re-join the college immediately after the two months. She recalls that the experience took a toll on her health, as adequate rest was not possible with the workload. Breast-feeding the baby was difficult as there was no provision of a crèche at the college. Since it is illegal for government employees to form an association, no contractual worker at the college dared to ask for a fee hike. They quietly bore the burden of inflation. Finally, in 2017 a collective effort was made through a grievance letter addressed to the head of the institution. A hike of a nominal sum was given to all the contractual workers. In June 2018, an interview was conducted for permanent positions at the college and Tsering was recruited. However, she had mixed feelings about the appointment. She says the interview is based on a system where each candidate is marked on the basis of marks scored in the matriculation examinations, senior secondary examination, undergraduate and higher education. This system unfairly gives an edge to younger candidates. During her time at university, it was difficult for Tsering to score high marks. With changing rules and teachers becoming more lenient with marks these days, the younger generation will definitely have an advantage over the older candidates. The problem does not end with the interview but continues even during the process of promotion. The weightage of her work experience as a contractual assistant professor was so minimal that she thinks it did not make any significant difference in the evaluation process after the interview. Candidates with no work experience were recruited along with her. After the probation period of one year, she will have to start again from scratch. During this time, she will be paid a consolidated amount of Rs. 8000/- per month as per the policy of the institution. The reason cited by the institution is training, which, as a matter of fact, is just a repetition of her activities as an ad-hoc assistant professor. When asked about whether she has any suggestions in order to improve the present system, Tsering says the government needs to conduct interviews more regularly to fill vacant positions. The system of appointing contractual workers, only delays the process of filling vacancies. The end result is that contractual employees suffer from uncertainty and lack of job security. Tarak Agung Tarh, President of the All Arunachal Samgra Shikshan Abhiyan Teacher’s Association (AASSATA) has been working as an ad-hoc teacher for a government school in Arunachal Pradesh under the Samgra Shikshan Abhiyan. As an ad-hoc teacher, his work includes teaching, planning subject curriculum, classroom activity and test plans similar to that of a regular teacher. The appointment is made on a contractual basis for a period of two academic years. He said the SSA teachers are paid a consolidated amount of twenty one thousand rupees per month. After two years the contract is generally renewed but there are always uncertainties. In 2009 the Arunachal Pradesh Government quashed the cabinet decision of regularisation of SSA teachers, which was on the basis of seniority. The contractual and regular teachers are not paid equal remuneration even though they have the same responsibilities. In addition to lesser pay, they are not given travelling allowances, medical leaves, pension, house rent allowances and annual increment. As per the contract, they can avail of only a consolidated twelve day casual leave in a year. Often there is a delay in the payment of monthly salaries due to the lack of funds from the government. These conditions make it difficult for the teachers to perform their duties diligently. 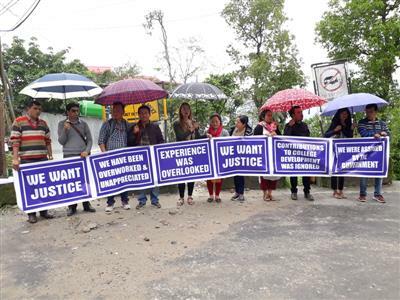 The SSA teachers working as contractual workers formed an All Arunachal Samgra Shikshan Abhiyan (AASSA) demanding regularisation of jobs based on seniority. They have staged many protests in the past and continue to do so. The most recent was a three-day dharna on the 8th of August 2018, which resulted in a shutdown of thousands of government schools across the state. However, the government has not been very responsive and has warned contractual teachers of consequences if they continue with the protest. Tarh says that in order to solve these problems, the government has to fulfil the demands of the protestors. This includes the implementation of the Opak Gao report, single window recruitment, enhancement of salary on par with the 7th pay commission and batch wise regularisation of teachers.